As you're reading the blogs of your fellow bloggers and maybe catching up on a few other things, you'll probably make one or more trips to your kitchen to refill your coffee, make yourself something to eat, or to grab a bag of chips or cookies to bring back to your desk and to munch on. Maybe you've even moved your laptop into the kitchen to have those things within easy reach. Hey, whatever it takes, right? I work from my desktop computer at home, which is upstairs from the kitchen. I'm fortunate in that Mary brings me what I need, since I have a few mobility issues, but usually the only thing I eat or drink while I'm working is coffee. What are some of your favorite things to eat and drink while you're writing your blog or reading other blogs? What's your favorite place to take your laptop (assuming you have one)? Enjoy, and keep on keepin' on! Not only is that my answer to your question, John, but it's the theme of my blog this month. I like to sit on my bed with my laptop and a cup of coffee while I'm reading other blogs. I know it isn't good for me and I do have a desk but it's somehow nicer sprawled out on the bed with cats enhancing the view. Coffee in the morning, tea in the afternoon but I try not to eat while I'm working...too messy! Coffee. Laptop on lap, me on couch is the standard practice. I like to drink coffee sitting at my desktop computer at home. My kitchen is just around the corner. Coffee is a staple, though I switch to iced tea when the coffee pot runs out. Either one goes well with my laptop. I have some mobility issues, too, John. See you soon! 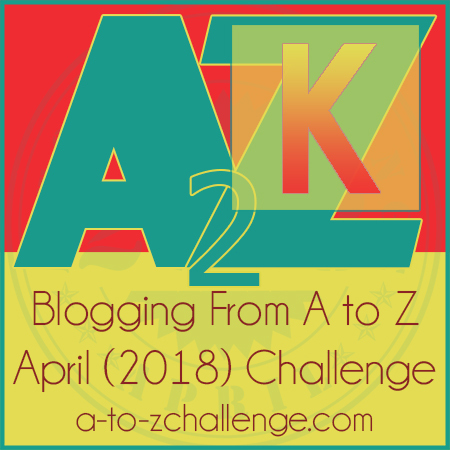 Thanks for co-hosting the A to Z Challenge, my friend. You'll find me at the start of the day with coffee while responding to comments left on my site or doing return visits. Sometimes, I'll have a bowl of cereal to go with my coffee. I prefer to not eat while blogging because that forms a bad habit of eating without thinking which tends to lead to more eating than needed. I do not need any more unwanted weight. I do have a laptop but I had to retire it because of a swollen battery. I prefer to use my iPad when I'm away from my iMac. It's purrfect for using in the living room while I doodle or check email or do a quick Internet search. It's time to move on to a few A2Zers. I'll see ya around the cyber block, my friend. Have a funtastic day! K for "Kneeling side leg raises"
I had been blogging on my tablet at the kitchen island but I've noticed that my hand falls asleep because of the upward angle!! I've been blogging on the desk in our bedroom lately and I ALMOST always have a diet pepsi or diet dr pepper with me!! creates a different zone. I notice art work on the walls, people, music playing. Nice to get in a different environment. I'm with Kalpaana on this. Sitting comfy on my bed is my favourite place to blog from (and is one of the only places in our home where I can't hear my husband's TV)! John, thanks for the post and for co-hosting. My laptop days are over so I take my wheelchair into our dedicated office. I drink water all the day interspersed with coffee, although MS & coffee are strange stomach-fellers. I don't eat or drink near the computer. Alas, I live in a mobile home, so my "desk" is technically in the kitchen. Tea, tea and more tea! (And the odd biscuit or three!) Have laptop will travel. Down to the kitchen, up to what will eventually be my workroom but most often on the sofa with half an eye on something on the TV. Be glad when the last child moves out later this month and will have my workroom back. Then I'll have a quiet spot to work in. Laptop, recliner, me: Tea, banana, orange juice, yogurt. And judging from the appearance of my keyboard, something that sheds crumbs. But they're hard to see through all the cat hair. Laptop, coffee shop, high stool at bar, me: Iced Aztec mocha (and breakfast taco if the need arises). Thanks for the Challenge. Coffee! The elixir of life. coffee! Seems to be universal! Tea also, and water - and anything that's easy to eat ... I work from my laptop, usually at my desk in my study, but we're away right now, so I'm on a balcony overlooking the sea ..
Never, ever, ever, release the Kraken. Here is my entry for K: "K is for Kraken", in which I tell you about this modern myth turned into D&D monster.